GROWCommunity promotes a seamless K-12 neighborhood school system in several North Side wards. LINCOLN SQUARE — During his inaugural run for alderman in 2011, Ameya Pawar pledged to prioritize neighborhood schools. Four years later, after plowing Tax Increment Financing dollars and aldermanic infrastructure money into the ward's elementary schools, the conversation pivoted to the neighborhood's high schools — Amundsen and Lake View — and Pawar realized he'd created a movement bigger than his office. "My job was to be a carnival barker, to talk neighborhood schools every chance I got. This needs to live beyond me," said the alderman, who's holding himself to a two-term limit. "This needs to have a sustained effort, and one not dependent on any one politician." The result is "GROWCommunity," a nonprofit organization that's in the process of obtaining its 501(c)(3) charitable designation. A recently announced grant of $125,000 from A Better Chicago, which more typically funds charter school initiatives, is a "huge deal" for the fledgling group, according to its executive director, Sarah Makela. For starters, it demonstrate that GROW's emphasis on neighborhood schools — specifically supporting a seamless K-12 neighborhood experience — is gaining traction outside of its North Side sphere. "Foundations were looking at choice in terms of charters," Pawar said. "Now GROW is a choice." The grant also gives the organization the financial wherewithal to expand its efforts, said Makela, a CPS parent herself, who wrote her doctoral dissertation on parent involvement in schools. 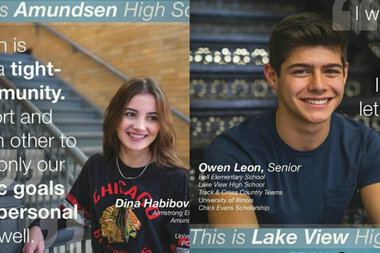 GROW's most visible work to date has taken the form of communication and outreach, like a recent postcard distributed to students at all of Amundsen's and Lake View's feeder elementary schools touting "top high school choices in our neighborhood." The group is also hosting a parent-to-parent panel discussion on May 21, during which parents of elementary school children can hear firsthand from Amundsen and Lake View parents about their experiences. "The focus right now is on the high schools but there's also an effort to better align the high schools and elementary schools," Makela said. Behind the scenes, GROW coordinates professional development sessions for teachers, and serves as a hub for information sharing and collaboration among the high schools and the elementary schools, which span the 47th, , 46th, 44th and 40th wards, according to Makela. GROW has also taken point in managing the schools' partnership with UChicago Impact, which was announced in 2015. With the infusion of grant dollars, the organization can now take on more of all of the above, Makela said. Its formerly "bare bones" website just debuted a redesign with beefed up content, and there could be more events like the parent panel on the horizon. "There's also a long-term goal for GROWCommunity to serve as a model for other neighborhood systems," Makela said. Success for the organization will be relatively simple to measure. "Everyone would be on board with our fabulous neighborhood schools," she said. GROW's parent-to-parent panel is scheduled for 2-4 p.m. May 21 at Big Bricks, 3832 N. Lincoln Ave. The event is free, including appetizers and soft drinks (but with cash bar), and registration is encouraged (click here).